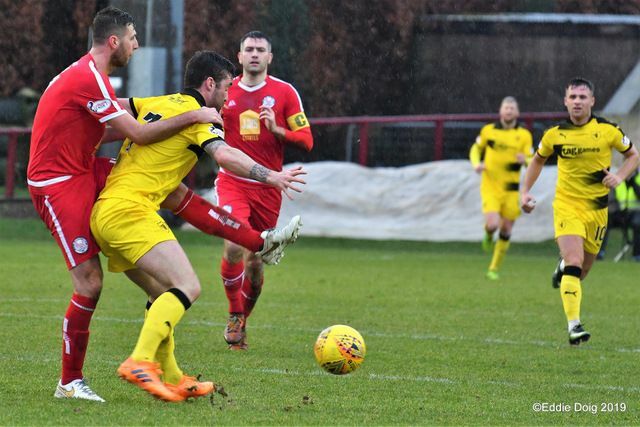 Raith Rover’s inconsistent away form returned to haunt John McGlynn’s side again this afternoon, as his side fell to defeat at Glebe Park to a direct-running Brechin City side. 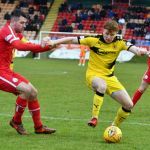 Second-half goals from Euan Smith and Ross Kananagh were enough to overturn Kevin Nisbet’s first-half opener for Raith, who also suffered the loss of Lewis Vaughan to a serious-looking injury. 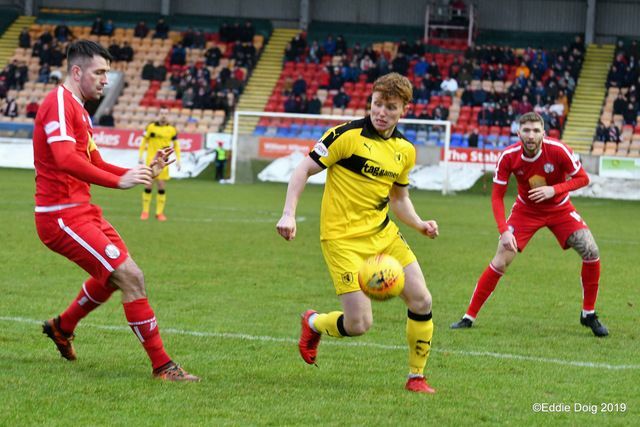 While Raith showed quality in the final third, and were resolute in defence for the most part, Rovers had little answer to Brechin’s pace on the counter in the second half, with man-of-the-match midfielder Kalvin Orsi a key figure for City. 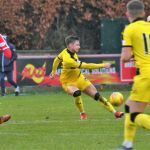 Rovers now occupy second place in the League One table, but only one point from East Fife, and three from Forfar – both of whom were victorious today. 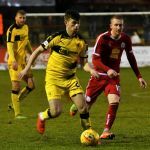 Following the euphoria of last week’s Fife Cup derby win, Raith arrived at Glebe Park full of confidence. 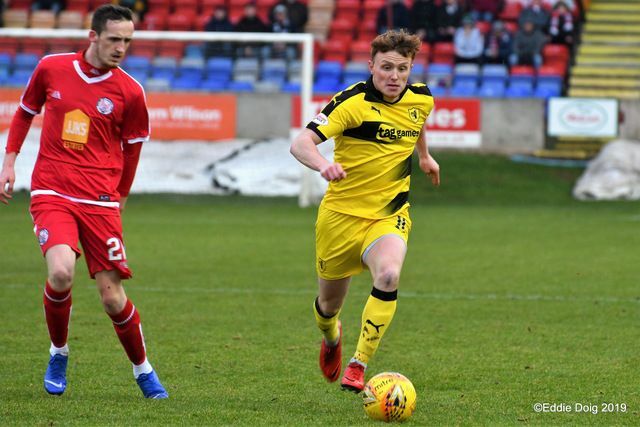 The mid-week loss of Daniel Armstrong – transferred to Ross County after a brief but highly positive spell at Starks Park – handed a starting role to Tony Dingwall, recent arrival from Victoria Park. 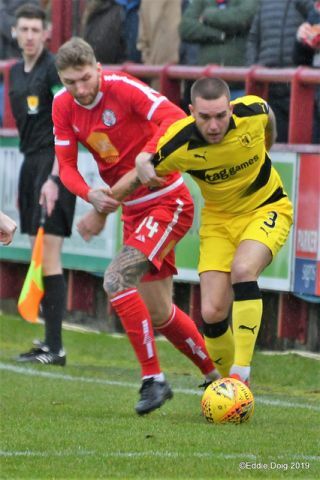 There was a welcome return for Kevin Nisbet, who missed outthe previous week after failing a late fitness test; Raith’s leading striker took his place amongst the Rovers’ substitutes. 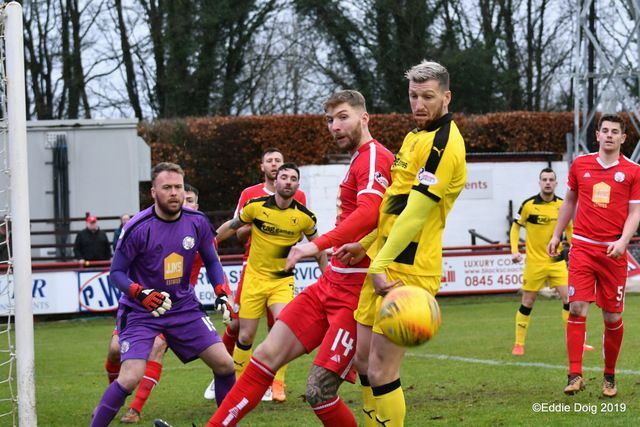 Brechin, sitting second from bottom in the League One table, didn’t have their troubles to seek. 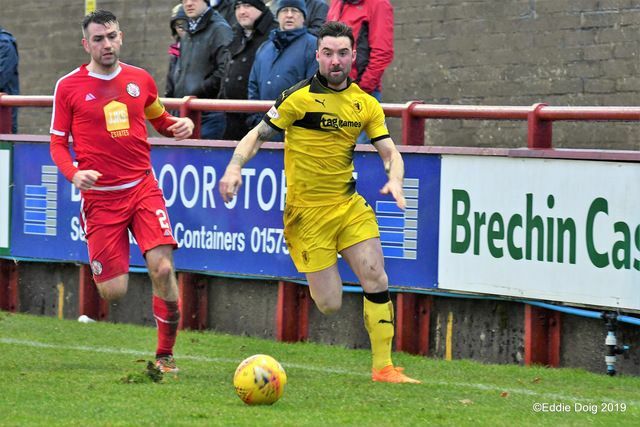 While last week’s 1-0 win over Dumbarton was deserved, those three points had ended a run of seven straight defeats. 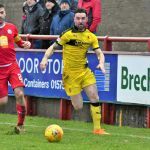 Following last season’s relegation from the Championship, City have looked unable to arrest a sense of decline – while top scorer Andrew Jackson has found the net seven times, a return of only five wins has left Brechin in a battle with Stenhousemuir and Dumbarton to avoid a further relegation. 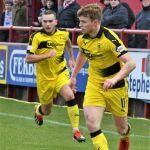 In a further blow, striker Callum Hendry had returned to parent club St Johnstone – new signings in midfield Craig Thomson and Lewis Toshney looked to help their side build the strength needed to retain League One status. 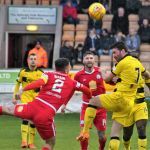 Injuries to Jordan Tapping, Dene Shields, and Ryan McGeever left City only able to name two outfield substitutes. 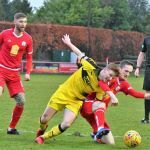 Under grey skies heavy with the portents of rain, Brechin kicked off and looked to press on from the outset. 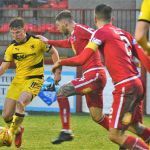 Manager Barry Smith boomed instructions to his charges from the opening seconds – midfielder Euan Smith had an early shot blocked away. Raith, with Duggan upfront and Dingwall and Flanagan either side, took a moment to settle. 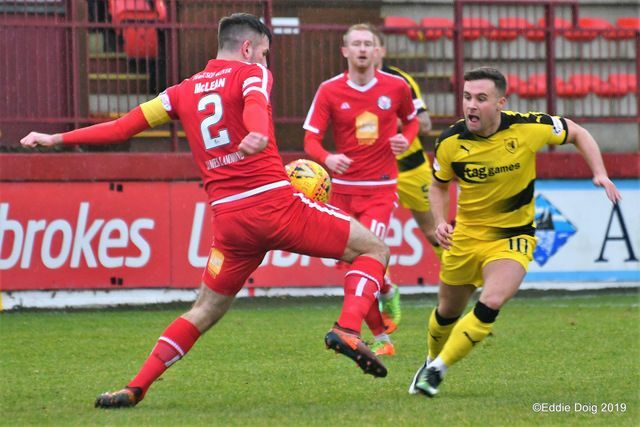 Kicking down the Glebe Park slope, it was five minutes before O’Neill in the City goal was tested, with Flanagan then Davidson crossing into the area. Duggan tried to draw an early foul from Hill; Vaughan’s shot on the turn was also deflected away. 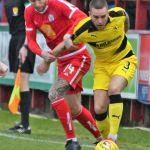 Dingwall found Duggan with a delightful cross-field ball after seven minutes, McLean heading clear to avert the danger. City were showing a sense of purpose belying their troubled League position. 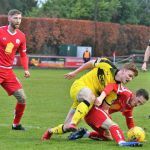 Stepping out of defence impressively, captain McLean invited Orsi to run at the Raith defence with ten minutes gone – a sliding challenge from Benedictus (with City players screaming for a handball) prevented a clear run in on goal. At the other end, Vaughan played in Duggan, the striker’s cross-shot blocked by O’Neill. Vaughan’s lovely first touch took him inside McLean, his dipping half-volley producing a fine block from O’Neill, by now the busier of the two keepers. With steady rain now falling on the already heavy turf, both sides continued to pass the ball well. 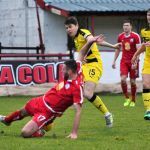 Murray escaped down Raith’s right, Hill clearing a dangerous-looking cross; almost immediately, Orsi broke with purpose down Brechin’s left. Jackson, cutting inside Davidson, fired into Thomson’s side netting. 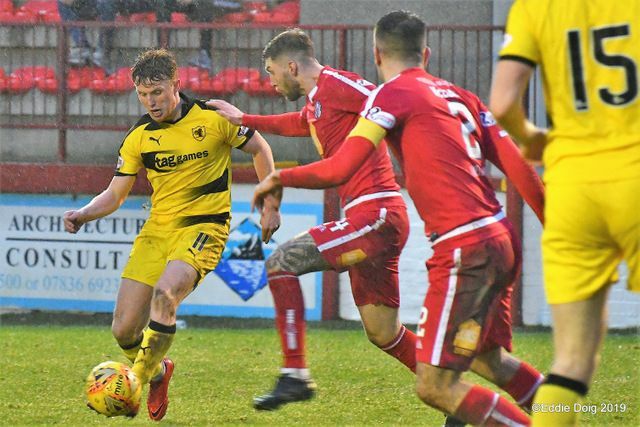 By the mid-point of the half, a gap in Raith’s formation looked to have been exposed – twice in two minutes, Andy Jackson dropped deep into the space between defence and midfield, turning and running at Davidson and Benedictus. 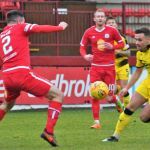 Let down by a poor pass from Sinclair with his first break, the striker found a seam behind Gillespie and Wedderburn and burst forward soon after – the striker eventually crowded out. 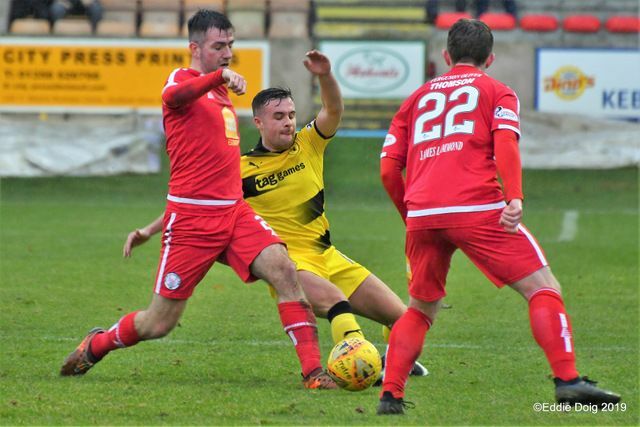 A real worry on the half-hour – Vaughan collided heavily with Thomson, and while both players went down, the Raith man’s injury looked much worse. Helped from the field by medical staff, respectful applause followed the Raith striker down the tunnel. 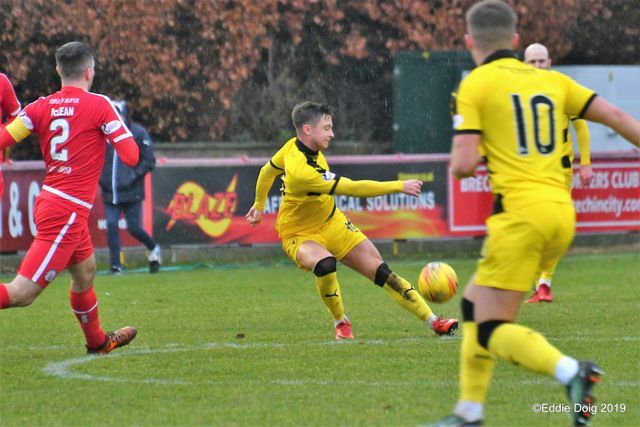 Kevin Nisbet’s return the first team as substitute to the stricken Vaughan immediately bore fruit – picking up a pass on the edge of the area, the striker bustled through Hill’s challenge, and clipped a smart finish beyond O’Neill to put Rovers one up. 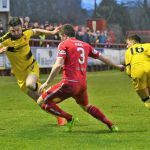 Brechin were stung into action – Jackson barrelled into Gillespie, picking up the loose ball and sprinting forward. 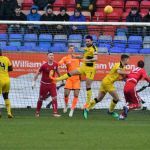 Thomson fed McLean, and Thomson saved well at his near post. 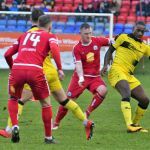 While the experienced striker regularly engaged with both Wedderburn and Gillespie, he often lacked support. 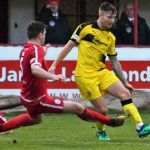 Brechin’s success would depend on their support for the lone striker. As half-time approached, both sides had half-chances. 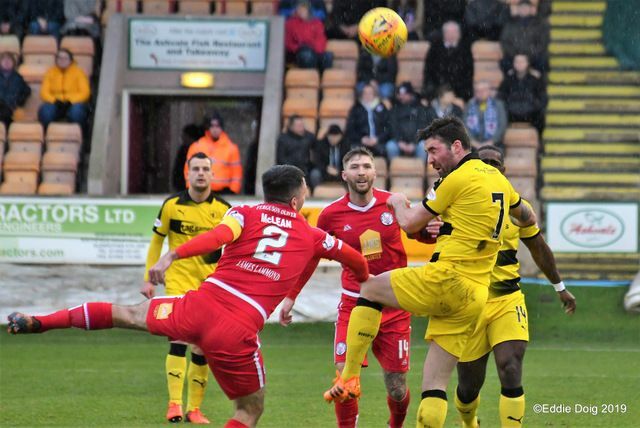 Duggan’s flicked header took a cross beyond the better-placed Dingwall; at the other end, Jackson rose above Benedictus, but couldn’t get enough power in his header to trouble Thomson. Flanagan drew a foul from Burns, but could only send his curling free-kick high over O’Neill’s cross-bar. 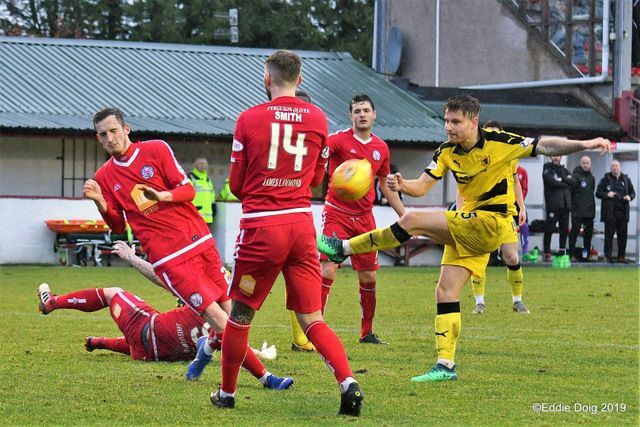 Dingwall walloped a shot goalwards, Toshney taking the brunt of the winger’s strike on goal – with the last action of the half, this time it was Gillespie thumping a full-blooded drive into the Brechin man’s midriff – no-one would need their half-time cup of tea more than Toshney. 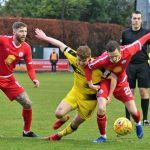 Rovers flew out of the blocks in the second-half – Wedderburn burst past two, Flanagan found Duggan, and only McLean’s clearance in the six-yard box kept a golden opportunity from Dingwall at the far post. Moments later, Gillespie won a tackle in midfield, and Flanagan was away down the right – O’Neill gathered under pressure at his near post. 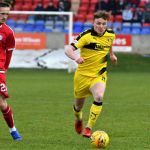 With City’s first foray forward, Orsi’s cross drifted beyond Davidson and Kavanagh, nearly drifting in beyond Thomson. On fifty minutes, a fine chance for the home side. 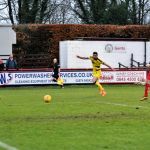 Thomson, bursting infield from right-back, played in Jackson – the striker turned Benedictus well, and should have done better with his finish. A moment later, an equaliser. 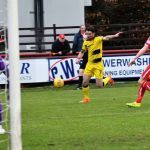 From a free kick on half-way, Orsi squared across goal – Euan Smith capitalised on some slack marking, turning beyond Thomson with a smart right-foot finish, his first goal for the club putting the sides on level terms. 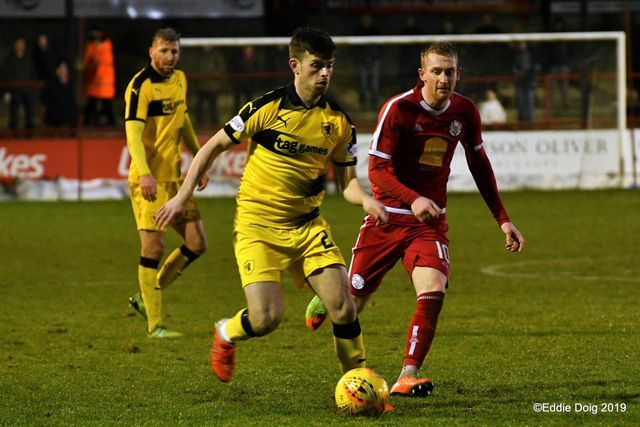 Raith responded with a series of corners in front of their supporters, but City held firm. Released by Kavanagh, Smith’s inviting cross fell just beyond Jackson. Kavanagh himself was inches away from another cross seconds later. With the match opening up, play moved swiftly from end to end. 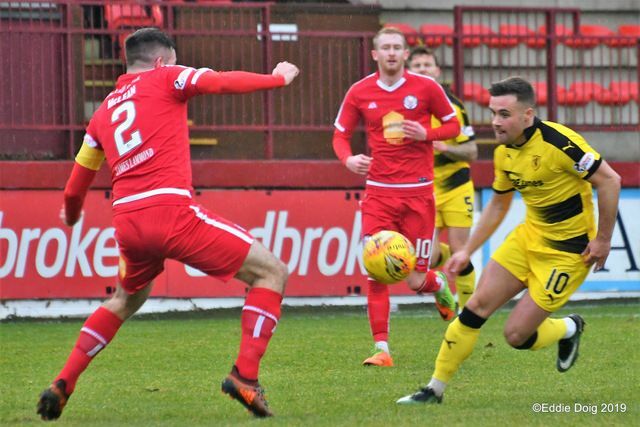 Kavanagh and Thomson thundered down Raith’s left, with Crane regularly forced to turn; for Rovers, Flanagan found space behind left-back Burns – Nisbet’s knock-down just fell beyond Duggan, from one inviting Flanagan cross. Nisbet battled past McLean, his shot blocked for another corner. 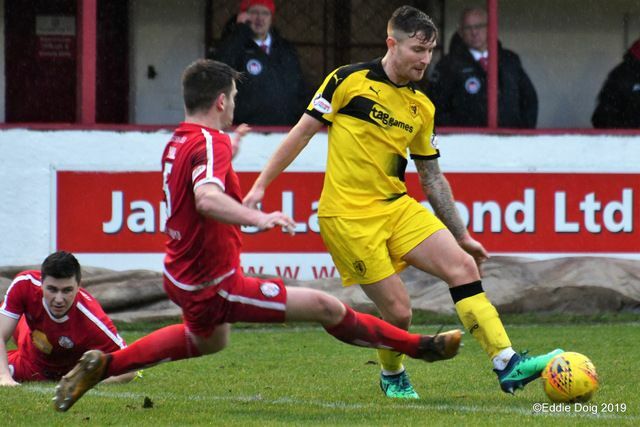 A lightning break from Brechin from a Raith corner on sixty-two minutes – McLean, stepping over Flanagan, burst over half-way; Jackson rounded Gillespie, and brought a fine block from the onrushing Thomson. 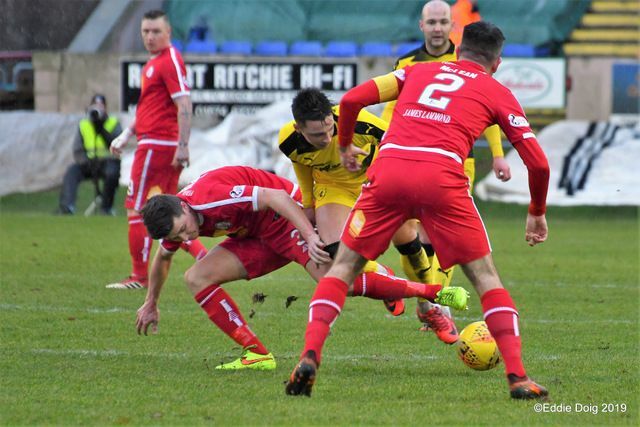 Hill clattered Flanagan to bring a premature halt to Raith’s next attack, earning a deserved yellow card. 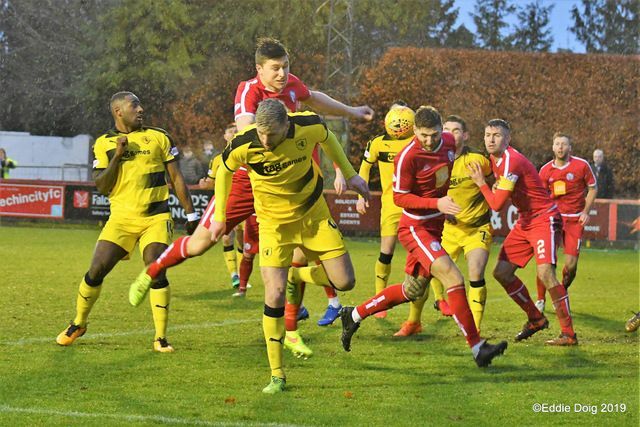 With Raith’s craft and Brechin’s pace on the break creating an open second-half, with half-an-hour to go, the match was fascinatingly poised. 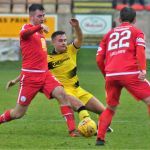 O’Neill pulled off a fine save to deny Raith a second – with Nisbet’s cross striking a hand in the Brechin box, referee Euan Anderson allowed play to continue. Murray’s powerful downward header was clawed away by O’Neill at full stretch. 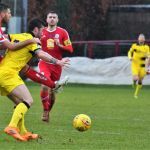 Another quick-fire counter-attack saw Brechin take the lead on sixty-seven minutes, amid real controversy – Murray was clattered at a Raith corner; with Raith players claiming a penalty, the speedy Orsi was away. 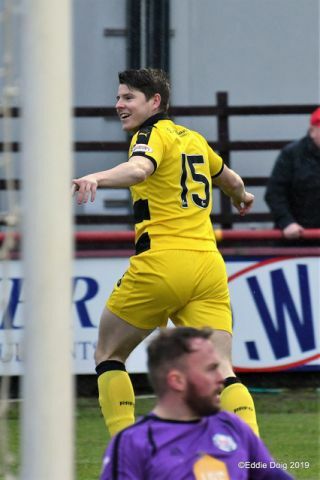 Jackson squared, allowing Euan Smith to fire at Thomson; the supporting Kavanagh was in the right place at the right time to knock home the rebound. 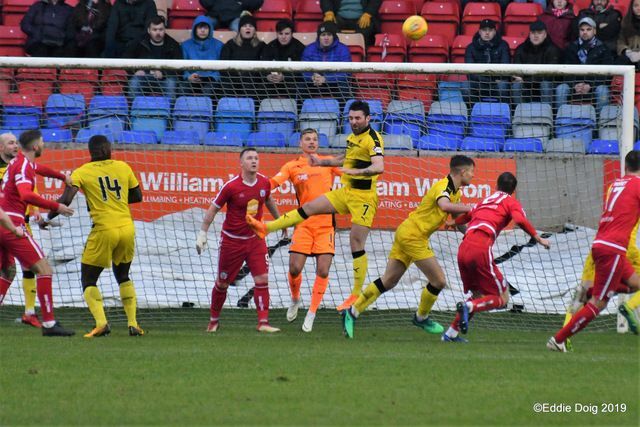 Denied a penalty at one end, Raith now found themselves a goal down, and staring another away defeat in the face. 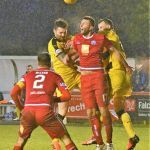 Referee Anderson was trying to let the match flow – Crane and Kavanaugh grappled regularly without an intervening whistle, Gillespie and Wedderburn often clashed with Toshney and Sinclair, and Nisbet was constantly battling with Dougie Hill. 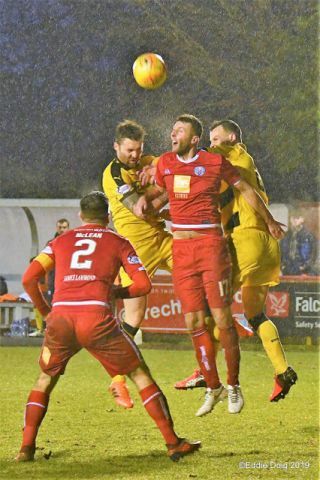 In the final half-hour, play flew from one end to the other as a result. 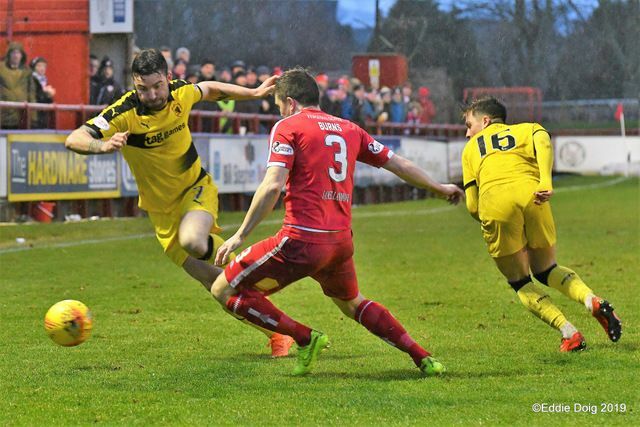 While Raith perhaps had more quality in the final third, Brechin’s direct running was juxtaposed but effective. 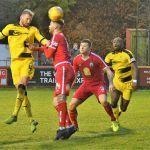 The home side scented a second home win on the trot. 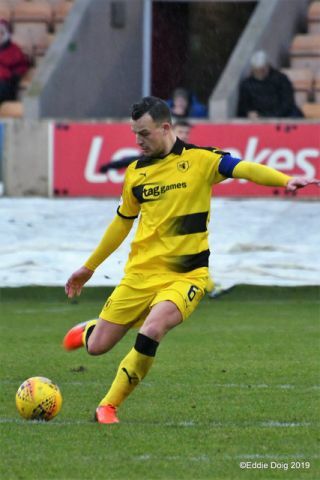 Substitute Craig McGuffie – having arrived at Starks Park this week from Ayr United – forced a fine save from O’Neill with ten minutes left; exchanging passes with Gillespie, McGuffie’s drive looked goalbound, but for O’Neill’s outstretched fingertip save. 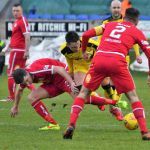 Nisbet’s drive struck a leg; Duggan’s header was thumped clear by McLean. Nisbet played in Crane, with Burns sliding in to clear. 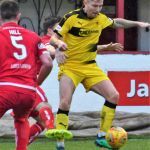 With Raith encamped in the Brechin half, Duggan surged past Burns and fell – referee Anderson decided Duggan was already on his way down – a yellow card the result. 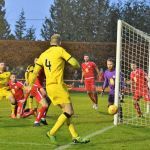 As the match moved into injury time, Gillespie found Murray wide right – his driven cross was met firmly by Dingwall, his flashing header dropping just the wrong side of O’Neill’s far post. 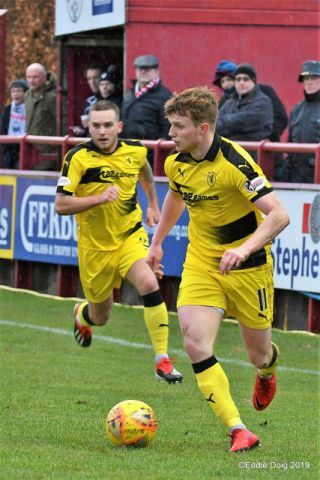 The winger, and the Raith support, held their heads. 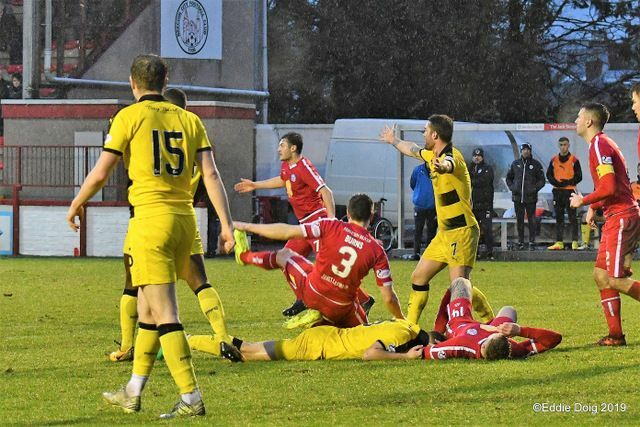 With rain cascading down under the Glebe Park floodlights, Raith threw bodies forward in a last effort – McGuffie’s shot blocked by Toshney the last clear effort on goal. 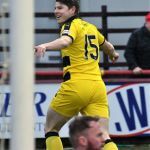 With a linesman’s flag halting Nisbet in his tracks, referee Anderson’s final whistle was met with joy in the main stand, and a chorus of boos from the travelling Raith support. 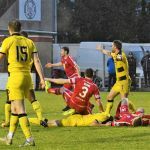 While both sets of players gave their all, Brechin’s second goal – and Raith’s penalty shout moments earlier – decided the outcome. 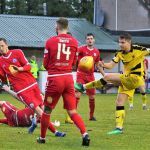 Coupled with Vaughan’s injury, a sodden Saturday on the north-east had brought Raith crashing back to earth after the joys of the previous week’s Cup derby win. With East Fife and Forfar both winning, Raith’s interest in the League One title race now looks to be for second place. Rovers warming up in their yellow away strip. Fairly mild, but damp afternoon at Glebe Park. 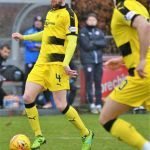 Nisbet and McGuffie on the bench. Interestingly, Brechin only have three subs on the team sheet and one is a goalie. Benedictus leads the team out. Rovers shooting into the covered terracing in the first half. Quiet start to the game. Vaughan free kick not cleared, but Davidson unable to capitalise. 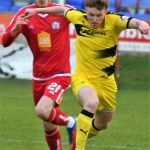 Good work from Dingwall and Duggan. Corner Raith. Hill fouls Gillespie on halfway line. 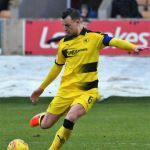 Raith fans welcome back Nisbet as he warms up behind the goals. O’Neil spills a Duggan shot, but no one there to put away the rebound. Great low Strike from Vaughan well saved by O’Neil. Rovers on top just now. 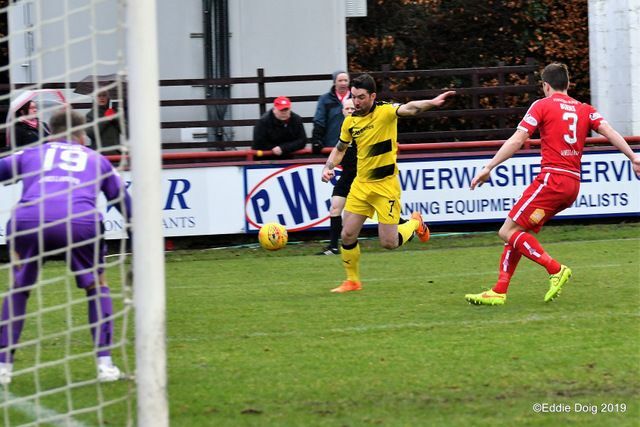 First shot from Brechin whistles past the post. Good pressure from Vaughan forces Hill to clear for a throw in. 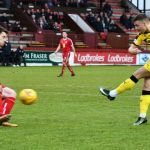 Half chance for Brechin. Out for a throw by the corner flag. Vaughan down and screaming to the bench. NISBET’S first shot is blocked, but comes straight back to him. He buries the second chance. Orsi’s shot too weak to worry Thomson. Corner Raith. Flanagan to take it. 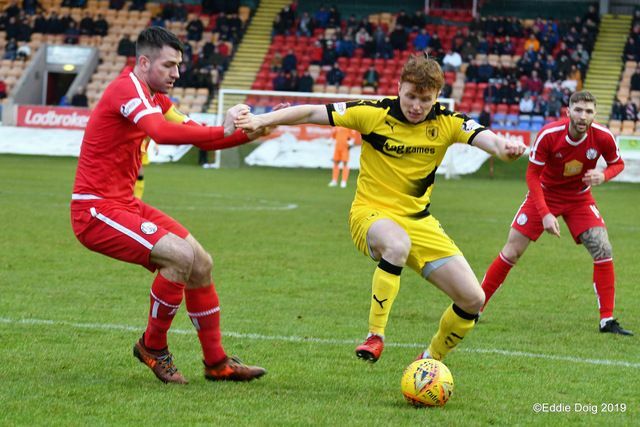 Straight into hands of O’Neil. 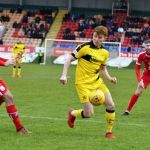 Davidson back on the pitch. Superb mazy from Flanagan in the box. His chip just to high for Duggan. Corner Raith. Flanagan will have a go. Just too high from Flanagan. Keeper only just clears before Duggan arrives. Out for a throw. 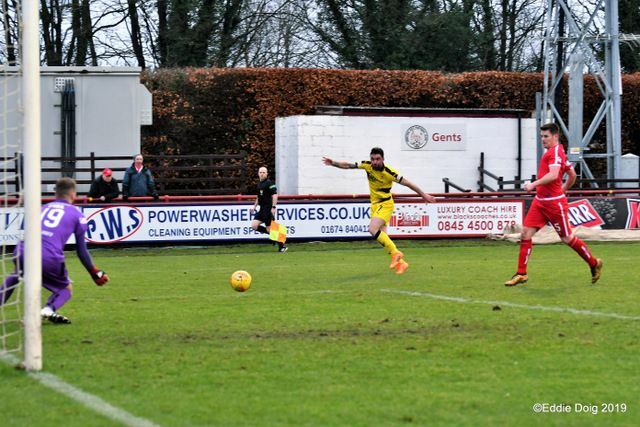 Blistering shot from Dingwall blocked and out for a corner. 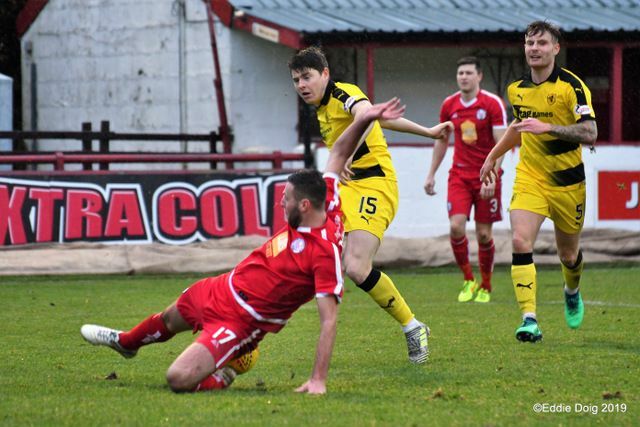 Brechin 0-1 Raith. Half time. Vaughan sitting in the dugout during the break. He looks distraught. Murray races down the right. His low cross has no takers. 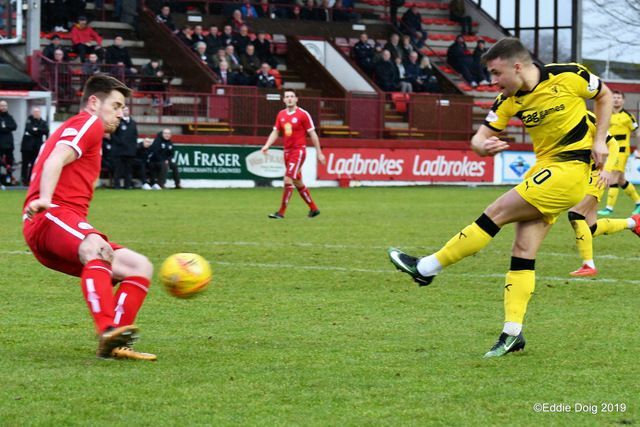 Brechin shot just wide. That looked close! Jackson turns, unmarked in the box. Just wide. Not the start Raith were hoping for. Euan Smith scores from close range. Davidson’s flick well saved and out for another corner. 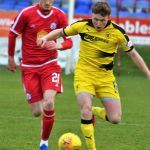 Nisbet heads down to Dingwall. 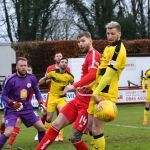 Good defending from Brechin saves the day. Another cute flick from Davidson. Not takers though. 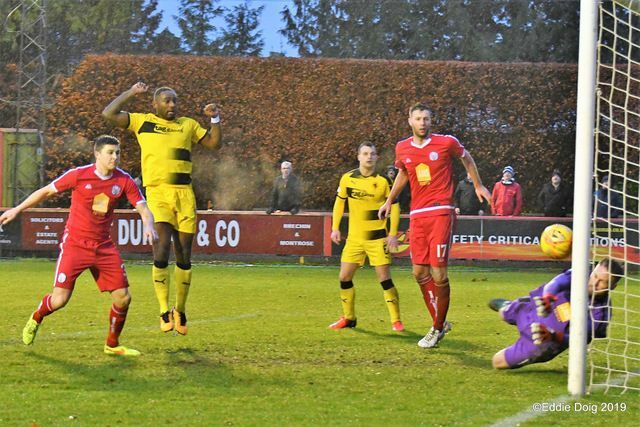 Brechin break straight from the corner and it takes a superb save from Thomson to avoid going a goal down. Davidson brings out an incredible save from O’Neil from a rehearsed free kick. Duggan fouled 30 yards out. Another quick break from Brechin. Thomson saves initial shot, but Kavanagh scores on the rebound. 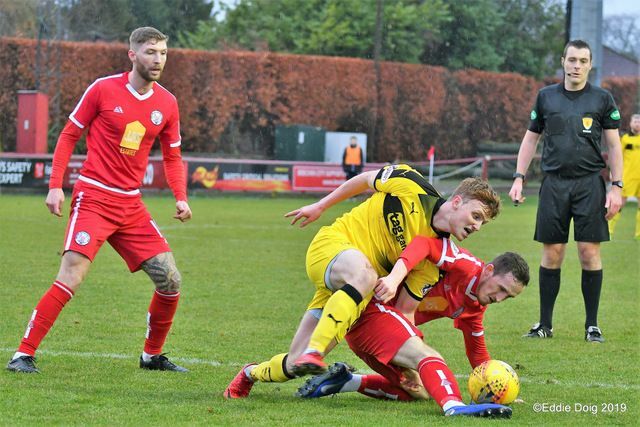 Gillespie booked for a silly foul deep in the Brechin half. 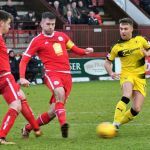 Brechin - Lynas replaces Kavanagh. Scrappy affair now. 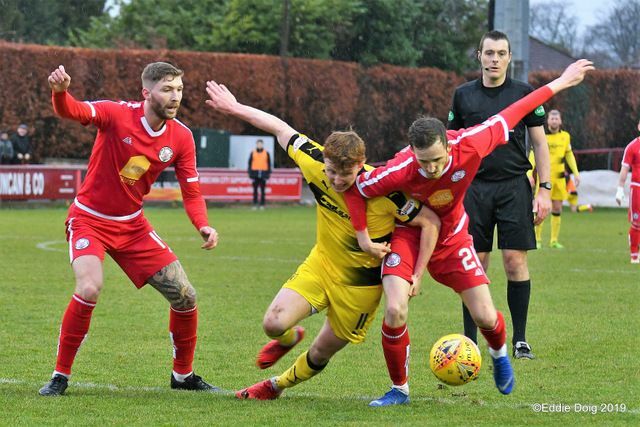 Brechin are going to be hard to break down. Cracking drive from McGuffie tipped over the bar. Corner Raith. 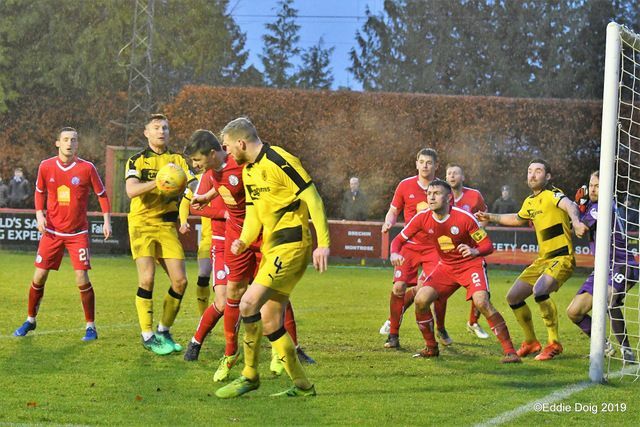 Raith encamped in Brechin half. Full time. 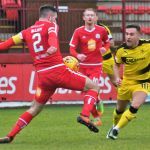 Brechin 2-1 Raith. Hugely disappointing second half from Raith Rovers. 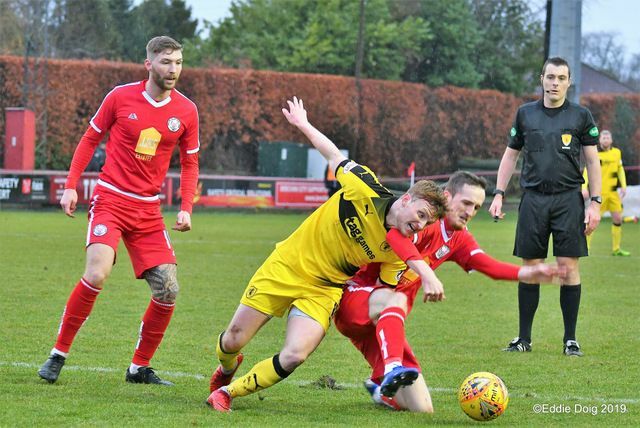 Brechin City: Patrick O’Neil, Paul McLean, Sean Burns, Dougie Hill, Kalvin Orsi, Andy Jackson, Jordan Sinclair, Euan Smith, Lewis Toshney, Ross Kavanagh, Craig Thomson. Subs - Lynas, Morena, Bowman. 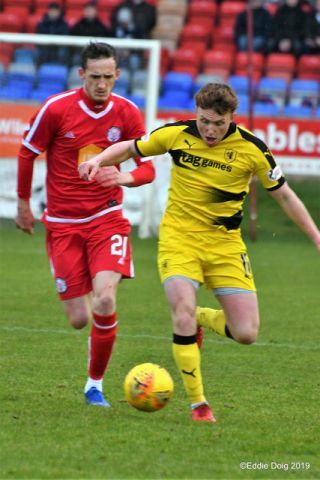 Raith Rovers: Robbie Thomson, Callum Crane, Iain Davidson, Euan Murray, Kyle Benedictus, Chris Duggan, Grant Gillespie, Lewis Vaughan, Tony Dingwall, Nat Wedderburn, Nathan Flanagan. Subs - Buchanan, Matthews, Nisbet, McKay, Watson, McGuffie, Lyness. 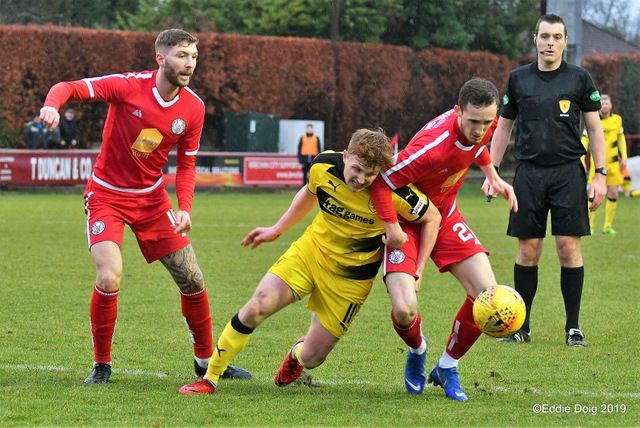 After the fantastic 3-0 Scottish Cup victory over Dunfermline last weekend, Rovers head to the Angus region for the fifth time this season, to take on Barry Smith’s Brechin City. 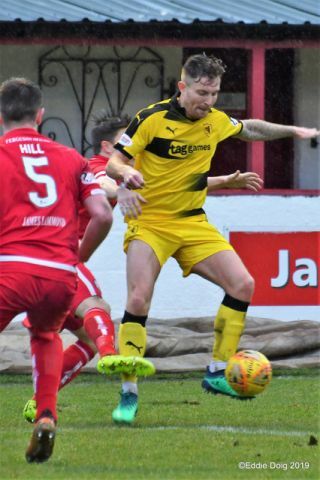 The ex-Raith boss took over from Darren Dods in November, after the Glebe Parkers had lost five of their first 12 matches, but he’s experienced a mixed start to his tenure, with two league wins and six defeats in his league games at the helm. 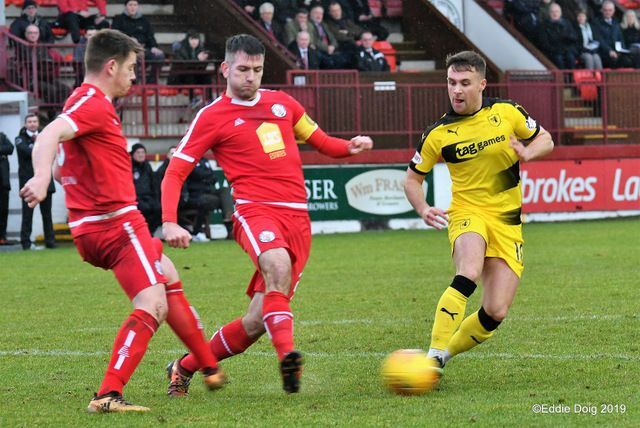 One of those wins was their most recent outing though, with a 1-0 win over Dumbarton two weeks ago, a result which moved them three points ahead of bottom side Stenhousemuir. 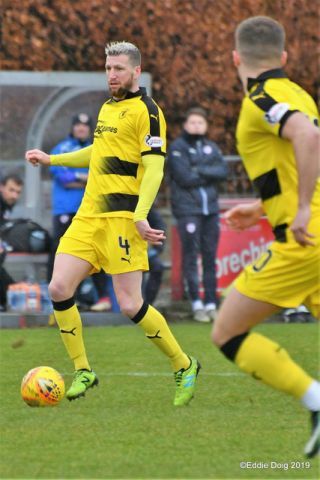 Playing a major part in that victory was former Raith midfielder Scott Robertson, who recently joined Brechin on a part-time basis, combining a playing role with his coaching position at Dundee United. 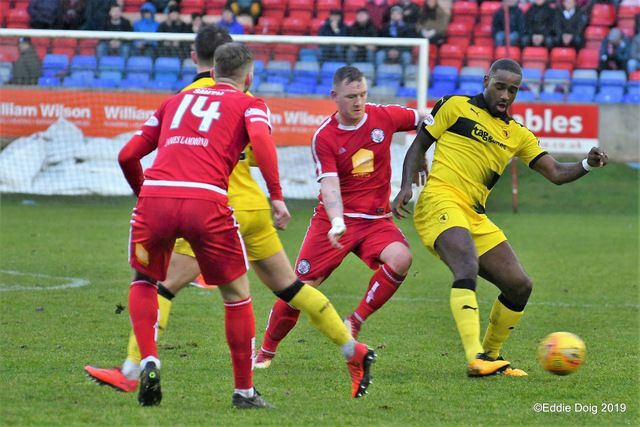 This will be the two sides third meeting this season, and while Rovers have taken four points from a possible six, they’ve found the going tough on both occasions. 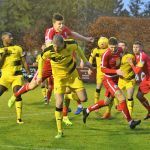 A Kevin Nisbet penalty handed Rovers the initiative at Glebe Park back in September, but a Boris Melingui goal with three minutes remaining meant the points were shared. 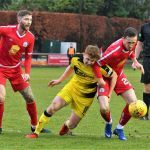 Rovers came out on top in the match up at the beginning of November, with a Nisbet brace putting Rovers two up, although an injury time Andy Jackson goal made the scoreline slightly tighter. 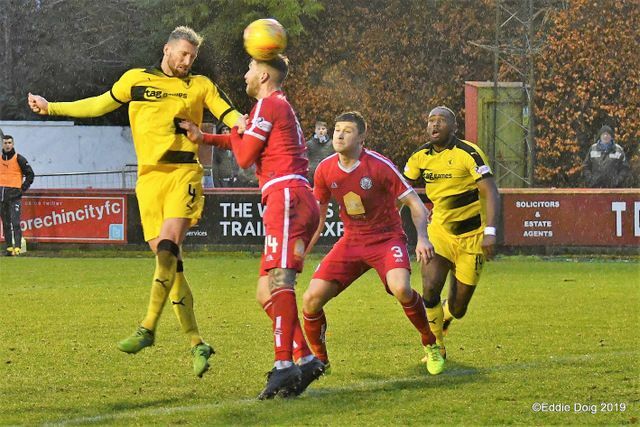 Despite that win, the two clubs head-to-head record is neck-and-neck over their most recent meetings, with three wins and four draws apiece from their last 10 matches. 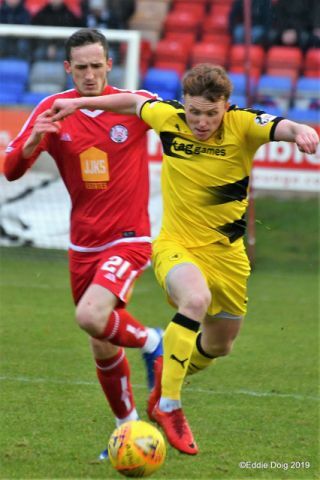 Saturday’s match referee will be Euan Anderson.